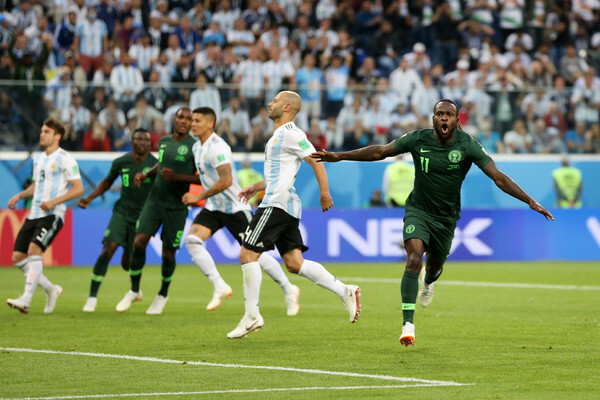 Super Eagles star Victor Moses has announced his retirement from international football. The 27-year old made the announcement on his social media pages today. In the statement released, the Chelsea winger stated that he wants to concentrate on his club career and also his young family. "However I feel that now is the right time to step away in order to be able to focus fully on club career and my young family as well as to allow the next generation of Super Eagle stars the opportunity to step up and to flourish". Maybe he felt there is nothing else to achieve with the National team, he has won the African cup of Nations back in 2013 and represented Nigeria at two World Cup tournaments. Victor Moses is currently trying to get back into the starting XI of Chelsea, he was one of the players that took the fall as Maurizio Sarri replaced fellow Italian Antonio Conte. Conte converted Moses to a right-wing back and he was a regular for the blues in the last two seasons, playing a crucial part in the London club's title-winning season in the 2016/17 and FA Cup trophy last season, but it seems he is currently struggling after Sarri switched to a back four which does not require a wing back but a fullback. He came on as a second-half substitute in the game against Huddersfield in Sarri's first competitive game as a Chelsea coach and played as a right winger in the front three. If the coach sees him as a right winger, he would have to battle Pedro, Willian, Hazard, and young star Hudson-Odoi for a place in the starting line up depending on how the former Napoli wants to play. Not starting the preseason early with Sarri didn't help his chances as he was involved with the Super Eagles at the just concluded World Cup. This announcement would make Sarri see how serious he is with his project and the club, it would also give him enough time to concentrate on understanding the coach's new style of play and more time on the training ground when other players are away with their National teams. Victor Moses 37 caps for Nigeria, scoring 12 goals. He was one of the most crucial players in the current team led by coach Gernot Rohr.